We provide all types of face and body waxing services for both women and men. All waxing services are performed by one of our trained aestheticians in one of our quiet, comfortable spa rooms. Our wax treatment technicians take the utmost care to protect the health and elasticity of the skin. Paying close attention to detail, the wax is applied warm, then removed gently, leaving the skin luxuriously smooth. Where shaving removes just the surface of the hair, leaving the follicle, waxing removes the hair from the root, leaving skin smooth and silky for weeks. Over time, the hair grows back lighter and finer. Whether you want a glamorous dramatic look for a special occasion or prom, flawless perfection for your wedding day, or just want to update your everyday makeup routine, our professional makeup artists will customize a look for you that will accentuate your skin tone and eye color, and enhance your natural beauty. Our makeup artists stay up to date with all the latest trends, tools and techniques including custom blended foundations, temporary eyelashes and airbrush makeup. Sublime Salon & Spa would like to introduce our new line of makeup, Pinnacle Cosmetics. Our makeup is of the highest quality available and is hypoallergenic, fragrance free, allergy tested, and non-comedogenic. 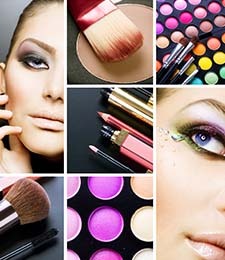 We also offer many of the cosmetic products for sale so that you can duplicate the same look at home. Sublime Salon & Spa is proud to be named the 2017 Winner of Best of Bucks for Eyelash Extensions! NovaLash semi-permanent Eyelash Extensions are a glamorous way to extend the length and thickness of your natural eyelashes, and are a practical, convenient, beautiful alternative to the daily use of mascara. Unlike the decades-old traditional false lashes, eyelash extensions are the first innovation in lash lengthening that can be worn daily, without nightly removal. Because each tapered, synthetic curled lash is bonded to a single natural eyelash by our certified professionally trained eyelash extension specialist, the final result transforms your existing lashes into something truly amazing. And the best part is that they are virtually undetectable, so only you will know that you have eyelash extensions! * For Refills after 4 weeks, clients must have at least 50% of lashes intact or Full Set price will be charged. ** If your original set was not done by Sublime, your Refill may incur extra time & extra charges. 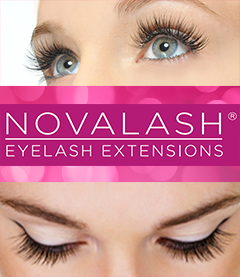 NovaLash Eyelash Extensions are synthetic strands that are made to replicate a natural eyelash. When applied, eyelash extensions lengthen and thicken your own natural eyelashes. Single strands are applied to each individual eyelash, one by one, by our certified professional Eyelash Extension technician. With proper application, lash extensions look and feel completely natural. When applied by a certified professional, eyelash extensions will last the length of the natural growth cycle of your eyelashes, usually between 4 and 8 weeks. Depending on your activity and day-to-day routine, with proper maintenance, should only be required about every 4 weeks. We recommend getting a refill every 3 to 4 weeks. A refill is needed to fill in any lashes that have fallen out due to the natural cycle of your own lashes. Refill appointments require approximately 60 minutes. Are NovaLash Eyelash Extensions safe? Sublime Salon & Spa only uses pharmaceutical grade adhesive. The eyelash extensions are not applied directly to your skin. Instead, they are adhered to your individual natural lashes, about 1mm away from your skin. The procedure is pain-free and will not pull out your natural lashes. While eyelash extensions are completely safe and ophthalmologist tested, any known allergies should be discussed with your technician prior to the application. Mascara is not really required since the extensions actually give the illusion of wearing mascara. In fact, one of the many benefits of eyelash extensions is that you do not need to use mascara. If you must apply mascara, however, only use water-based mascara. DO NOT USE OIL-BASED OR WATER-PROOF MASCARA as they can dissolve the bonding agent used and they can shorten the life of your eyelash extensions. We recommend the glycol and carbonate-free NovaLash mascara, which is included in the NovaLash Aftercare kit. Use care when washing off the water-based mascara and only use a water based eye makeup remover. Yes. The bonding agent used to apply your eyelash extensions is waterproof and allows you to shower, swim, exercise etc. You can wash your face the same day that your eyelash extensions are applied, however you must avoid the eye area. We recommend that you do not wash your eye area for about 24-48 hours after the eyelash application. Are there any "Don'ts" ? Do not get lashes wet for the first 24-48 hours. Avoid hot steam or sauna. For longer lasting lashes, limit the use of running water directly on your lashes. Avoid rubbing your eyes excessively. Do not use waterproof or oil based mascara. And, only use water based eye makeup remover. Do not use a mechanical eyelash curler. Do not pull on your lashes. What is the best way to maintain my eyelash extensions? Nightly conditioning is necessary to maximize the life of your eyelash extensions. NovaLash's night time conditioning pads are perfect for cleaning the lashes free of makeup, while moisturizing the lashes to maintain flexibility. Use a clean, dry mascara wand daily to gently comb the lashes free of any tangles. There is a Novalash Aftercare kit - sold separately for $45 - which is highly recommended for optimal stay time of the extensions. The NovaLash AfterCare Kit contains Night time Conditioner and Cleansing Pads with pomegranate seed extract for conditioning, glycol and carbonate-free NovaLash Mascara, an extra mascara wand to comb through the lashes each morning, and an Aftercare Instruction Card. The application process for lash extensions normally takes about 120 minutes for a full set of lashes and 60 minutes for a refill. You will lay comfortably on a massage table in our spa area with your eyes closed. Relaxing music is played while our professional technician applies your lash extensions. Your lower lashes will be covered. The eyelash extensions will be then applied to your upper lashes one at a time. Many clients even fall asleep during the procedure! Eyelash extensions are available in a number of lengths and thickness. Your technician will consult with you to understand what type of style you are interested in. The overall look of the lashes is very natural. Yes! Since lash extensions are not applied to your skin, they do not conflict or interfere with your contacts or normal daily activities. Before getting a full set of lashes for the first time, you should thoroughly clean your natural lashes with a mild cleanser. For Full Set sand Refills: Do not use oily makeup remover to clean your lashes prior to the application. Lashes should not be curled and all mascara should be removed. Your face should be thoroughly washed and all face and eye makeup should be removed. Do not put any moisturizer on your face before your appointment. If you already have eyelash extensions from another salon, please let us know when we are booking your first appointment as we will need extra time to remove your old eyelash extensions.